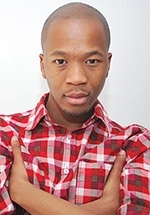 Muzi Mthembu is a South African actor best known for his starring role as Simphiwe "Simi" Mdoda, a gay employee at the Centburg Department of Home Affairs, in the Vuzu satirical sitcom Check-Coast. It was his first starring role on television. An LGBT activist who works with LGBT refugees and migrants living in Johannesburg, Mthembu received a Bachelor of Dramatic Art, Drama from the University of the Witwatersrand, where he studied from 2006-2010. In 2014 he guest starred in an episode of the eKasi+ sitcom uSkroef noSexy. In 2015 he landed his second starring role in television when he replaced Atandwa Kani in the role of Kenny Ngubeni, Gugu's flamboyantly gay brother who runs the revue show bar in the casino, for the second season of the SABC3 telenovela High Rollers. In 2017 Muzi played the recurring role of Diliza in the MTV Base drama series MTV Shuga: Down South, making his first appearance on 22 March (Season 5, Episode 3). Later that year he had a guest starring role as a photographer in the Mzansi Magic telenovela Ring of Lies, first appearing in Season 2, Episode 34 (which aired on 26 September).